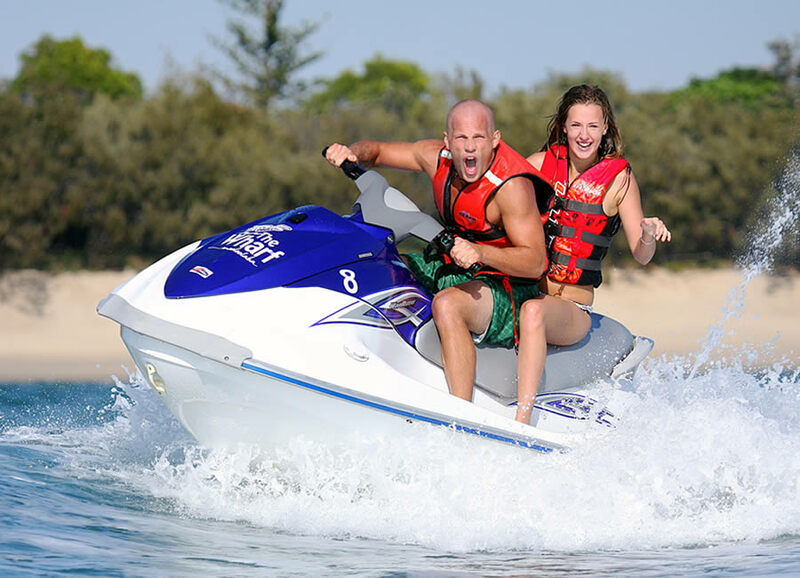 The ultimate jet skiing experience is the largest and fastest open Ocean Jet Ski Hire on The Sunshine Coast. Experience the power of a jet ski out in the ocean and get your adrenaline pumping! With over 3 sq.km of open ocean, you can go in any direction you want. Slow, fast or flat out the power is at your fingertips! Double up at no extra cost. 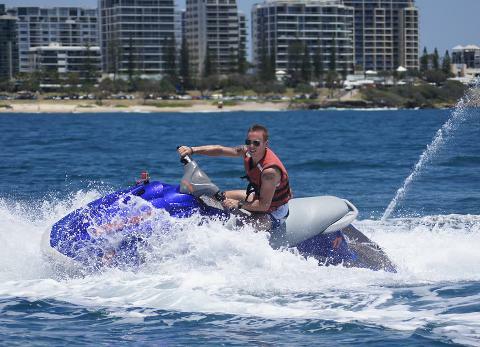 The minimum age to hire a jet ski is 16, however anyone under 16 can ride with a responsible adult (18) on board. Your safety is always paramount and to ensure it’s the best day of your holidays a professional rescue boat will be there to assist you. Away from the doldrums of river circuits and flat water, here at Ocean Jet Ski we have no compulsory circuit, no round and round in circles, just pure adrenaline pumping wave riding with heaps of carving, donuts, fish tails, and sharp turns. If you’re serious about your fun- this is an epic experience! No license required, we show you all operation and handling, issue you with life jackets, give you safety briefings and we show you all the tricks and manoeuvres. Your safety is paramount, for safe ocean riding we allow a maximum of 2 people per Jet Ski subject to weight and weather conditions. 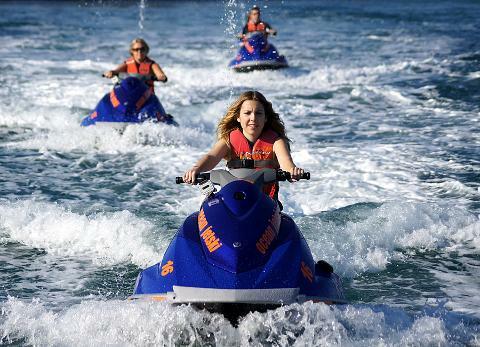 Jet skiing is a fast and safe activity if certain rules are adhered to. These rules and regulations are designed for you enjoyment, safety and safety of others. PLEASE READ THEM VERY CAREFULLY. WHEN RIDING YOUR JET SKI ENSURE YOU CAN SEE ALL OTHER WATER USERS IT IS YOUR RESPONSABILITY TO STAY CLEAR AND GIVE WAY TO OTHERS. If you have any medical conditions that may affect or be affected by riding a hired Jet Ski please specify. At all time we are observing you. If you are having any difficulty or feel unsafe return to the rescue boat or wave your arms to attract further attention. Wait on your ski if it is safe to do so. Otherwise abandon your Jet Ski; your life jacket will keep you afloat at all times. If you are involved in a collision you must report to the rescue boat immediately. You are deemed responsible for your own safety, the safety of others and the care of your jet ski, as such, you ride at your own risk and you are responsible and will be held accountable for any damage and or injury caused willfully or by negligence on your part. Further costs can be brought against you. 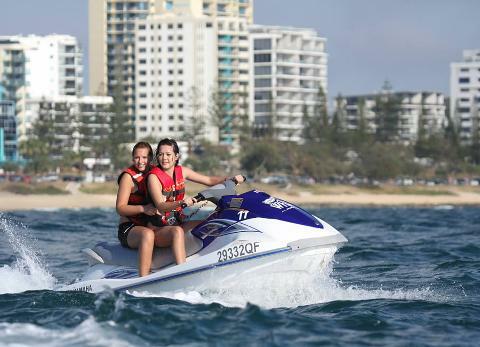 The owners, management and staff of Mooloolaba ocean jet ski hire and The wharf marine services reserves the right to refuse, cancel or stop any hire at any time without a refund if a person does not adhere to these rules. Or is negligent, remiss, not confident or a potential danger to themselves, other persons or property. WARNING – THIS MAY AFFECT YOUR LEGAL RIGHTS AND OBLIGATIONS. IF YOU HAVE ANY QUESTIONS PLEASE ASK YOUR REPRESENTATIVE BEFORE SIGNING. Like any activity, it can be dangerous and that by participation in it I am exposed to certain risks, therefore: -I ACKNOWLEDGE AND UNDERSTAND that whilst participating in the Activity: -· The conditions in which the activity is conducted may vary without warning.· Other persons participating in the Activity may cause me injury or damage to my property for which they may be liable.· I may cause injury to other persons or damage their property, for which I may be liable.· I may cause loss of damage to property used / hired for which I would be liable.· I may be injured suffer damage to my property as a result of my negligence or breach of contract.· There may be no or inadequate facilities for treatment or transport of me if I am injured.· I assume the risk of and responsibility for any injury, death or property damage resulting from my participation.· I will take special attention to all instructions oral or written and will query any matters that I do not understand.· I am not under the influence of drugs / medication / mind altering substances that effect my understanding of safety instructions or ability to safety participate.· I do not have any allergies that affect my ability to participate any aspect of this activity.· I do not suffer from any mental infirmity / allergies that may prejudice my performance/safety or the safety of others.· I name and acknowledge the full responsibility for participant less than 16 years of age. I release, indemnify and hold harmless the Service Provider, its servants and agents, from and against all and any actions or claims which may be made by me or on my behalf or by other parties for or in respect of or arising out of any injury, loss, damage or death caused to me or my property whether by negligence, breach of contract or in any way whatsoever. Before signing your boarding pass (part 2) you will have read and understood this entire document (part 1) and know that it affect your legal rights.